Who Are Fighting for the Guptas, Zuma At State Capture Inquiry? Activists protest against state capture in Cape Town (file photo). As the Zondo commission of inquiry into state capture got underway on Monday, the ANC urged its members and others to cooperate fully with it "so that the country can deal with this difficult chapter". "The African National Congress notes the start of the Zondo commission on state capture this week. The national executive committee (NEC) of the ANC in May 2017 endorsed the establishment of such a judicial commission so that the facts and truth can come to light," reads a statement from ANC spokesperson Pule Mabe. The commission is the result of former public protector Thuli Madonsela's report, State of Capture, which was released in November 2016. Madonsela's remedial actions included that former president Jacob Zuma must appoint a commission into state capture, whose head had to be appointed by Chief Justice Mogoeng Mogoeng. Zuma unsuccessfully challenged this in court, and in January this year, on the eve of a crucial meeting of the ANC's NEC - which was expected to discuss his recall - Zuma announced the establishment of a commission of inquiry with Deputy Chief Justice Raymond Zondo as its head, as Mogoeng had recommended, saying "the matter cannot wait any longer". It was reported this weekend that Zuma would be expected to answer questions. His legal team said at Monday's proceedings it needed sufficient time to make "meaningful contributions". Finance Minister Nhlanhla Nene and Minister of Public Enterprises Pravin Gordhan, who were both fired by Zuma as finance ministers, are expected to testify, as is former deputy finance minister Mcebisi Jonas and ANC MP Vytjie Mentor, both of whom claimed the Guptas offered them jobs as Cabinet ministers. 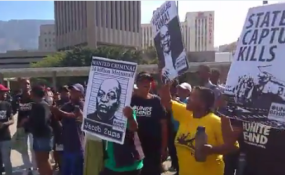 At the start of Monday's proceedings, Zondo said investigations were continuing while the commission was underway and called on people with information to come forward. He also said he had trouble obtaining information from Treasury and also struggled with assistance from the State Security Agency to get security clearances. "The ANC urges its members and others who are summoned to appear before the commission to offer their full cooperation to the commission, so that the country can deal with this difficult chapter," said Mabe in a statement. "The commission will assist to ensure that where wrongdoing was done appropriate action is taken and people are held accountable. "The allegations and reports on this matter have done immense damage to the image of the country and the confidence of ordinary citizens in state institutions. It is, therefore, crucial to ensure that the commission completes its work expeditiously."